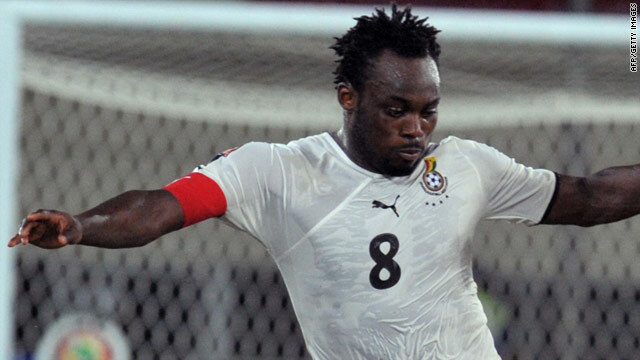 Ghana captain Michael Essien has not played for Chelsea since December due to hamstring and knee problems. (CNN) -- Ghana coach Milovan Rajevac has selected captain Michael Essien and defender John Mensah in his preliminary 29-man World Cup squad despite the duo still recovering from injuries. Midfielder Essien has not played for his English club Chelsea since December, when he suffered a hamstring injury before breaking down with a knee problem at the Africa Cup of Nations the following month. Midfielder Kevin-Prince Boateng, who also plays in England, was named by the Serbian coach on Tuesday despite still waiting for his nationality switch to be approved. Rajevac has recalled Inter Milan midfielder Sulley Muntari, who was dropped for the Africa Cup of Nations in January after deciding not to play in a friendly against Angola. New Ivory Coast manager Sven-Goran Eriksson named a predictably talent-laden 30-man squad, with his side favored to be the continent's best prospect in South Africa. The Elephants, who face Brazil, Portugal and North Korea in Group G, can call upon the English Premier League's top scorer Didier Drogba and his teammate at champions Chelsea, Salomon Kalou. The midfield ranks include Barcelona's Champions League winner Yaya Toure, Hamburg's Guy Demel and Cheick Tiote of Dutch champions FC Twente. Former England and Mexico coach Eriksson, who took over from Vahid Halilhodzic after a disappointing Africa Cup of Nations campaign, also has England-based defenders Emmanuel Eboue, Kolo Toure, Abdoulaye Meite and Steve Gohouri. Cameroon coach Paul Le Guen has given Rigobert Song the chance to appear at his fourth World Cup after naming the 33-year-old defender in his 30-man squad. Veteran midfielder Geremi, who also plays in Turkey, may play at his second tournament while Benoit Assou-Akotto is recalled after missing the Africa Cup of Nations through injury and his fellow Tottenham defender Sebastien Bassong is included too after being omitted for the Angola event by the Frenchman. Inter Milan striker Samuel Eto'o will continue as captain, having replaced Song when Le Guen took charge last year. South Africa coach Carlos Alberto Parreira named Benni McCarthy in his 29-man squad after the striker was dropped by predecessor Joel Santana and has struggled with injury since moving to English club West Ham in January. The Brazilian picked 10 Europe-based players, including captain Aaron Mokoena and midfielders Kagisho Dikgacoi and Steven Pienaar, but Nasief Morris of Spanish club Racing Santander missed out. Nigeria coach Lars Lagerback has given Nwankwo Kanu the chance to earn his third World Cup appearance despite the 33-year-old striker's limited opportunities with English club Portsmouth this season. Kanu's clubmate John Utaka has been recalled in the 30-man squad after being dropped by the Swede's sacked predecessor Amodu Shaibu, while midfielder Jon Obi Mikel is included despite missing the end of Chelsea's season due to minor knee surgery. Goalkeeper Bassey Akpan and Peter Suswan were the only Nigeria-based players selected.